Winner on home soil in March at the ITTF Challenge Series Polish Open, Marek Badowski emerged the player to cause the biggest upset at the quarter-final stage of the Under 21 Men’s Singles event at the Seamaster 2018 ITTF World Tour Asarel Bulgaria Open in Panagyurishte on Wednesday 15th August. Meanwhile, in the counterpart Under 21 Women’s Singles event, the player to attract the attention was Russia’s Valeria Shcherbatykh; she continued her quite unprecedented run of success. Hard fought contests were the order of the day with both Marek Badowski and Valeria Shcherbatykh emerging successful by the very narrowest of margins in their round of last eight duels. Mark Badowski, the no.6 seed, accounted for Slovenia’s Darko Jorgic, the no.2 seed (3-11, 11-7, 11-8, 11-9); Valeria Shcherbatykh, the no.17 seed, recovered from a two games to nil deficit to end the hopes of Korea Republic’s Kim Hayeong, the no.28 seed (4-11, 12-14, 11-9, 11-8, 14-12), a player very much in form. The previous day in the second round of proceedings, Kim Hayeong had beaten Japan’s Miyu Nagasaki, the no.2 seed, (9-11, 16-14, 5-11, 11-9, 12-10). Success for Russia but at quarter-final stage of the Under 21 Women’s Singles event, the most successful nation was China. Chen Ke, the top seed, overcame Japan’s Maki Shiomi, the no.10 seed, by the very narrowest of margins (13-15, 11-8, 11-9, 16-18, 13-11); in a similarly closely contest duel, Zhang Rui, the no.3 seed, accounted for colleague Sin Mingyang (11-5, 6-11, 8-11, 11-8, 13-11). Full distance wins, for Wang Yidi life was less fraught, she overcame Puerto Rico’s Adriana Diaz in three straight games (11-8, 11-9, 11-7). At the semi-final stage Chen Ke meets Wang Yidi, Zhang Rui opposes Valeria Shcherbatykh. 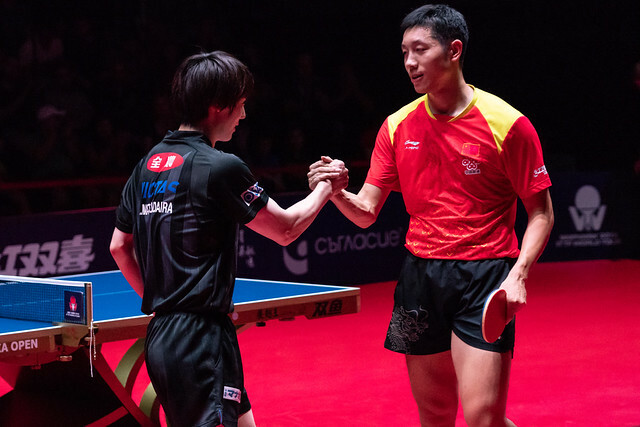 Notable performances from China; there was also one of note in the Under 21 Men’s Singles quarter-finals; Xu Haidong, the no.21 seed, ended the progress of Patryk Zatowka the no.8 seed. One Polish player defeated, he now meets another; in the penultimate round he faces Mark Badowski. Victory for Xu Haidong contrary to seeding; it was the same in the opposite half of the draw. Denmark’s Anders Lind, the no.7 seed, accounted for Austria’s Andreas Levenko, the no.4 seed (11-2, 11-9, 11-6). He now meets Chinese Taipei’s Lin Yun-Ju, the top seed; in the round of the last he ended the hopes of Aliaksandr Khanin of Belarus, the no.5 seed (11-9, 6-11, 14-12, 11-9). Play in both the Under 21 Men’s Singles and Under 21 Women’s Singles events will be played to a conclusion later in the day.